4 Piece Set Includes: Crib Blanket: 45 in. x 36 in., Fitted Crib Sheet: 52 in. x 28 in. x 8 in. pocket, Crib Skirt: 52 in. x 28 in. x 12 in. Drop, Diaper stacker: 15 in. x 20 in. x 6 in. The 4 Piece White and Coral Mod Diamond bumperless baby bedding collection will create a designer nursery with modern flair. 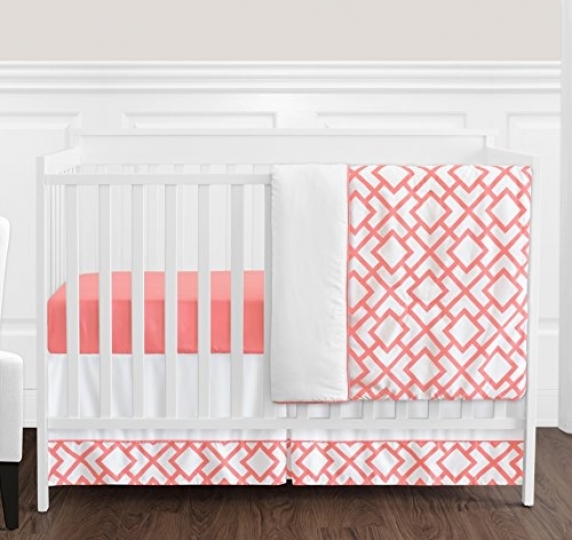 This stylish girl crib set features an exclusive white and coral diamond print paired with solid coral in exclusive brushed microfiber fabrics. This Sweet Jojo Designs set will fit most standard cribs and toddler beds and is machine washable for easy care and repeated use. Crib set includes: Crib Comforter, Fitted Sheet, Crib Skirt (Dust Ruffle) and Diaper Stacker. Sweet Jojo Designs creates various coordinating room accessories for all of their children's bedding sets including wall decor, hampers, lampshades and window treatments.